This example illustrates how you can obtain random samples from a known function. The target distributions are the normal distribution (a standard distribution) and a mixture of the normal distributions (a nonstandard distribution). For more information, see the sections Standard Distributions and Specifying a New Distribution). This example also shows how you can use PROC MCMC to estimate an integral (area under a curve). Monte Carlo simulation is data-independent; hence, you do not need an input data set from which to draw random samples from the desired distribution. The ODS GRAPHICS ON statement enables ODS Graphics. The PROC MCMC statement specifies the input and output data sets, a random number seed, and the size of the simulation sample. The STATISTICS= option displays only the summary and interval statistics. The ODS EXCLUDE statement excludes the display of the NObs table. 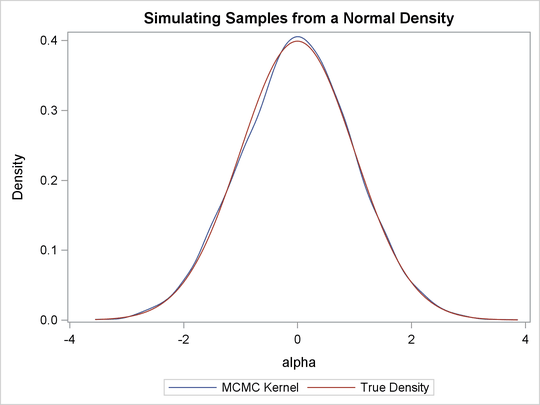 PROC MCMC draws independent samples from the normal distribution directly (see Output 59.1.1). Therefore, the simulation does not require any tuning, and PROC MCMC omits the default burn-in phrase. The summary statistics (Output 59.1.2) are what you would expect from a standard normal distribution. The trace plot (Output 59.1.3) shows perfect mixing with no autocorrelation in the lag plot. This is expected because these are independent draws. Output 59.1.4 shows the result. You can see that the kernel estimate and the true density are very similar to each other. 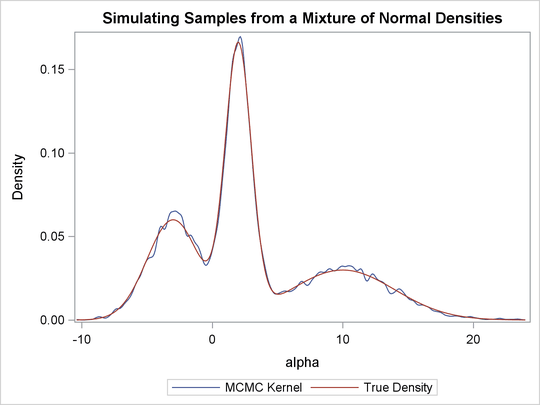 The macro %density creates an empty data set, invokes PROC MCMC, draws 10,000 samples from a beta(4, 12) distribution, displays summary and interval statistics, and generates a kernel density plot. Summary and interval statistics from the beta distribution are displayed in Output 59.1.5. The distribution is displayed in Output 59.1.6. 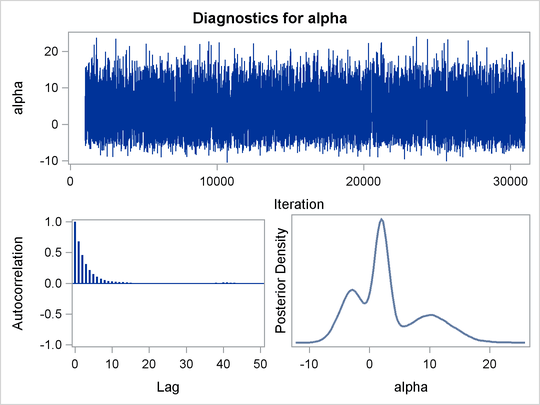 The ODS SELECT statement displays the diagnostic plots. All other tables, such as the NObs tables, are excluded. The PROC MCMC statement uses the input data set X, saves output to the Simout data set, sets a random number seed, and draws 30,000 samples. The LP assignment statement evaluates the log density of alpha at the mixture density, using the SAS function LOGPDF. 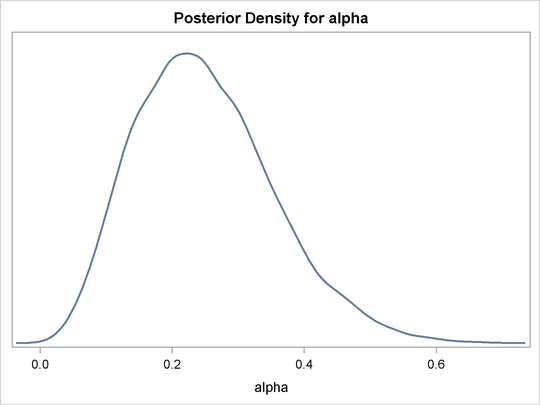 The number 3 after alpha in the LOGPDF function indicates that the density is a three-component normal mixture. The following three numbers, 0.3, 0.4, and 0.3, are the weights in the mixture; –3, 2, and 10 are the means; 2, 1, and 4 are the standard deviations. 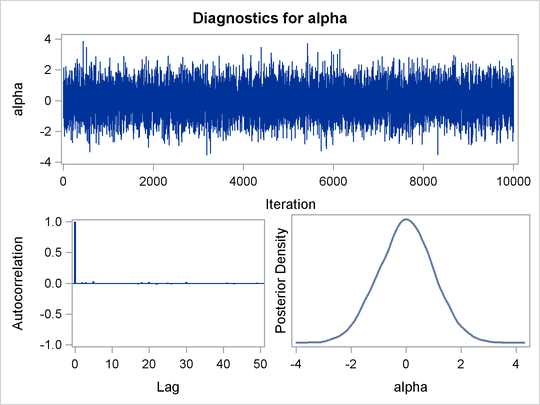 The PRIOR statement assigns this log density function to alpha as its prior. Note that the GENERAL function interprets the density on the log scale, and not the original scale–you must use the LOGPDF function, not the PDF function. Output 59.1.8 displays the results. The kernel density clearly shows three modes. Using the following set of statements similar to the previous example, you can overlay the estimated kernel density with the true density. The comparison is shown in Output 59.1.9. In this example, the NOLOGDIST option saves only a fraction of the time. But in more complex simulation schemes that involve a larger number of distributions and parameters, the time reduction could be significant.